1. Place racks in lower and upper thirds of oven; preheat to 350°. Whisk powdered sugar, cocoa powder, and salt in a large bowl, then whisk in egg whites and egg; fold in chocolate and cacao nibs. Spoon batter by the tablespoonful onto 2 parchment-lined baking sheets, spacing 2″ apart. 2. 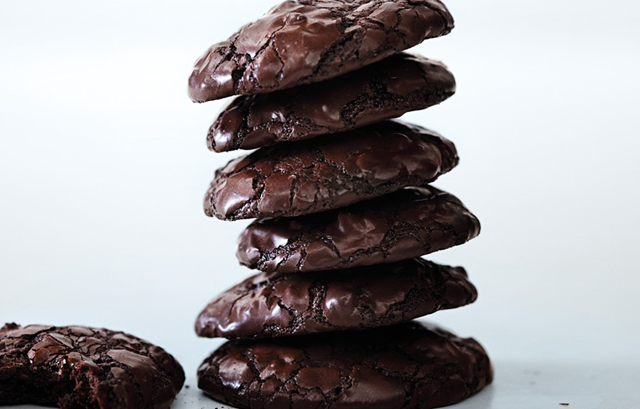 Bake, rotating sheets once, until cookies are puffed, cracked, and set just around the edges, 14-16 minutes. 3. Transfer baking sheets to wire racks and let cookies cool on pan (they’ll firm up). 4. Cookies can be baked 3 days ahead. Store airtight at room temperature.